Haley Maxie passes the ball up for the Lady Lions during an SCOL match against Chillicothe Thursday, Aug. 25, 2016 at Washington High School. (l-r); Hannah Haithcock (30), Victoria Jones, Taylor Long (42), Maxie, Madalyn Wayne (13) and Delaney Greer. 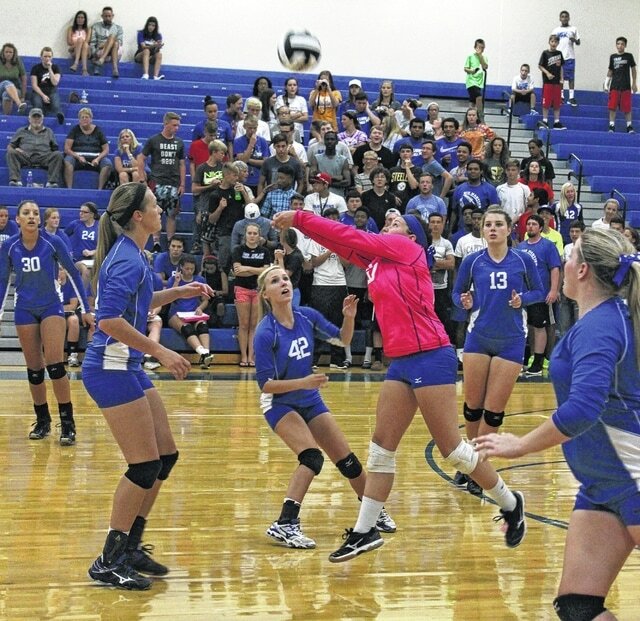 It was an early season showdown between two teams expected to contend for the South Central Ohio League title when the Chillicothe Lady Cavaliers brought their volleyball team to Washington High School Thursday. Last year, the teams split the season series and Chillicothe went on to dethrone Washington and end the Lady Lions’ streak of 11 consecutive SCOL titles. Chillicothe won the match Thursday, 3-0. Scores of the sets were: 25-14, 27-25 and 25-17. After dropping the first set, Washington seemed headed for a win in set No. 2 that would have evened the match. Washington took a 7-6 lead in the second set, going on a run to score six straight points to go in front, 13-6. The Lady Lions later led 16-8 and 19-11, their biggest lead of the match. From that juncture, the Lady Cavs slowly but steadily began their comeback. Chillicothe cut the lead to two points, 19-17. The Lady Lions got the next two points to edge closer to the win, 21-17. Washington led 22-18, only to see Chillicothe score five points in a row to go in front, 23-22. An ace by Delaney Greer gave Washington a 24-23 lead and a look at a set point. The Cavs tied the score, 24-24. Washington scored on a service error for another set point at 25-24. Chillicothe scored the next three points to take the set, 27-25. Washington led 6-5 and 7-6 in the third set, but, after Chillicothe tied things at 8-8, the visitors began to slowly pull away. The Cavs maintained a three to four point advantage until the score reached 20-15. After a timeout by the Lady Lions, Chillicothe outscored Washington 5-2 to take the set, 25-17 and the match. Chillicothe is now 2-0 overall and 2-0 in the SCOL. Washington is 1-1 overall, 1-1 in the SCOL. “I think we came out hitting well,” Washington head coach Ashley DeAtley said. “We couldn’t get our passes up to the net for our setters to be successful to mix it up like they needed to be. “In the second game, we were up on them,” DeAtley said. “We just lost our momentum; we lost our focus and we let them come back. We were up by eight points and we needed to keep on going. We tried to fight back, but we just couldn’t finish there at the end. “In the third game, we were letting balls drop,” DeAtley said. “We just couldn’t keep track of the ball. Our mental focus was gone there. “We beat them pretty good in the first game,” Chillicothe head coach Greg Tracey said. “They came out and made us earn the second one. They didn’t put us away and our girls mentally stuck with it long enough to squeak out that win. I think that kind of carried over to the third and helped us win that. “Court House is always tough. This is a tough place to play,” Tracey said. “Their fans come out and they were loud and they’re with their team. Mentally, we had to be strong to win here, so, I think we did that here today. Chillicothe will host Unioto Saturday at 11 a.m.
Washington will host London Saturday with the j-v game commencing at 10 a.m.
Chillicothe won the j-v match Thursday over Washington, 25-20, 25-19.